Andreas Caminada took a little castle in Fürstenau, Switzerland and transformed it into a rare and wonderful combination. One of the best restaurants in the world; inside a fairytale castle; in a wonderfully majestic area – the Swiss Alps. 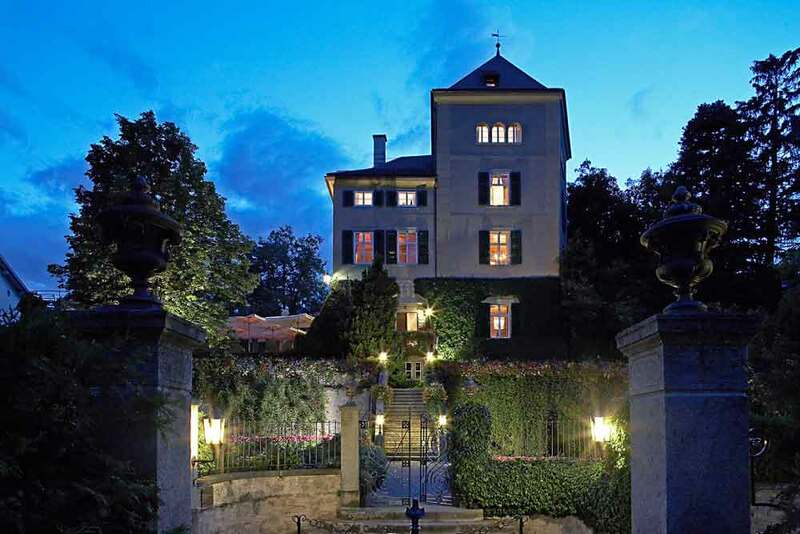 Schloss Schauenstein, is number 1 in the world on the Opinionated About Dining List Top 100+ European Restaurants 2018 and in the Top 50 of The World’s 50 Best Restaurants 2018. Almost every year since 2004 Andreas has been acknowledged in the industry as exceptional. “Discovery of the year”, “Rising Star of the Year” “Chef of the Year- Gault& Millau” (many times), “International Chef of the Year” Busche Verlag, Schlemmer Atlas, Germany. He’s even been anointed citizen of the year for goodness sake. A castle in the snow and a master in the kitchen. This incredible combination is the perfect recipe for a fairytale birthday adventure. It’s still dark. My feet as usual a little numb, tingle as I tiptoe across the bare wooden floor of our apartment. I should still be curled up, warm in our little Paris bed but I can’t wait to start this day. We are traveling to Switzerland to celebrate my birthday. I can’t remember a birthday since I was a child (or maybe ever?) where I have felt so excited. 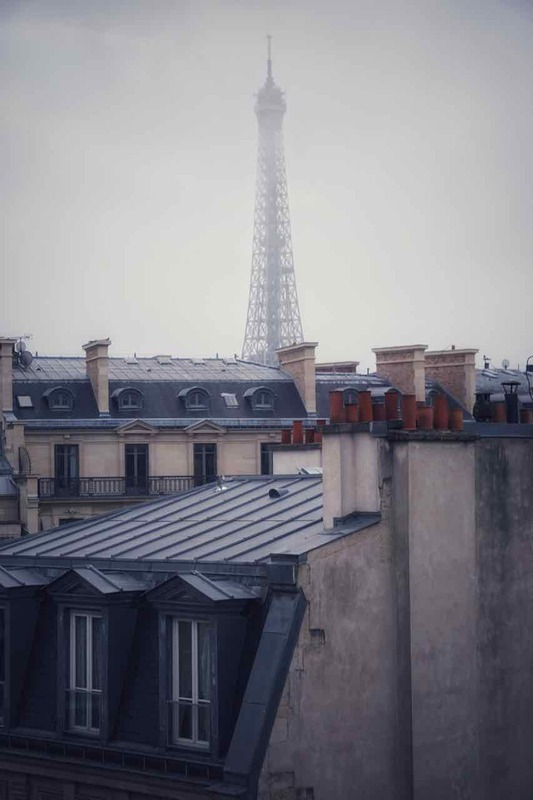 From our window the rooftops of Paris glow, the softness of the morning light outlining them against the darkness. Imaginings of Switzerland swirl in my mind, teasing me, inspiring my early morning flourish. Snow is a fantasy. I expect to see snow covering the mountains, but will I see it falling? To have our home base in Paris with small sojourns to other locations has been an ideal way of travelling. I think I have packing the small overnight bag down to a fine art now. I quickly toss an outfit for this evening, shoes, hair zhoosher, face paint and fragrance into my small overnight bag. iPad for writing and phone tossed into my shoulder bag and I’m ready for our last little side trip to Switzerland. There is something about travel that has opened a world of possibility for me, also allowing me to appreciate the peculiar way I see things. Where others may see misery I see beauty. This morning driving through the Paris streets in the rain, the sky is dark and grey, some might say miserable and drab. But I am happily mesmerised watching the monochrome hues of the trees through the taxi’s glass roof, the droplets of water wriggling across the glass turn the view through the semi bare tree canopies into a fascinating abstract painting. Just glorious. 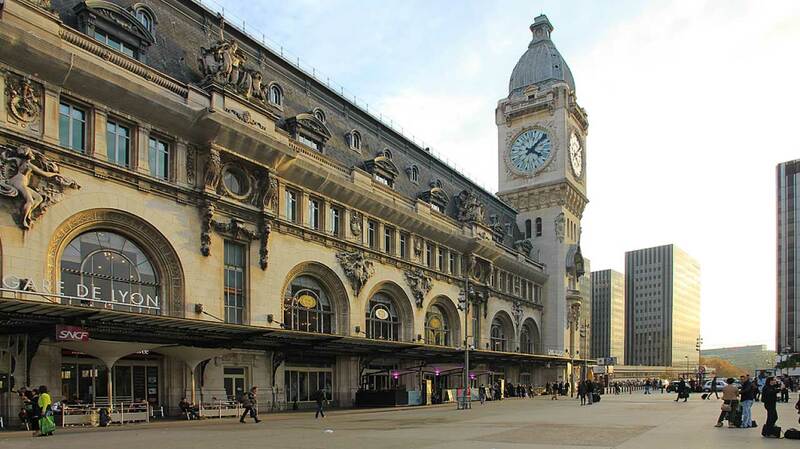 The architecturally gorgeous Gare de Lyon is one of Frances busiest train stations and where our fast train to Switzerland will depart this morning. Ornate and vast, rail enthusiasts regard the station as one of the prettiest in Paris. The majesty of the clock tower is awe-inspiring. Inside it is incredibly busy, people everywhere. Some gathered below big electric signs faces upturned, intently waiting for the big screen to flash up their platform. Some rushing like ants in various directions dragging suitcases behind them. Others shuffling along in steadily paced queues, past glass counters piled high with golden baguettes stuffed with delicious fillings, finally walking away with large paper bags. It is a kaleidoscope of colourful activity. Somehow it all seems to work perfectly. We have discovered that we rather like a train picnic so we scout around to find delicious sandwiches, drinks and things for our journey. I excitedly grab the ubiquitous paper bag, stuffed with our selections and balance it on my roller bag. Why is it that something as simple as placing our goodies in a paper bag feels so wholesome and connected? All aboard. We plop down into big wide comfy seats at our table for two with a big picture window and I am filled with a strange combination of exhilaration and relaxation. I am bursting with anticipation and excitement but I’m also kind of Zen because all I need to do for the next few hours is daydream and enjoy the view. As we hurtle through the French countryside, it is like watching a series of landscape paintings in fast forward. The first few are soft green with blue grey skies. Soon the skies darken and the mood becomes more intense. Almost like a moving piece of music where the tempo and intensity lifts toward a wonderful crescendo. The villages are so pretty. Gathered together are little creamy white houses topped with steep pitched brown/grey roofs, I guess to help snow slide off in the winter. The surrounding fields of tilled soil the colour of chocolate pudding, are sprinkled with Viridian green growth. The whole picture makes me think of a peppermint crisp chocolate. As I look out the window I can almost taste it. The Swiss border is close, the countryside undulates and the hills that Mother Earth has pushed urgently upward, turn white. Almost in slow motion big soft flakes of snow fall. Dancing in the breeze they spin mesmerisingly outside my window. I have seen snow before, on the ground, on hills in the distance, but I haven’t ever witnessed a proper snow fall. With my nose almost pressed against the window glass, I feel like a child, filled with naïve excitement. My body fights to sit in a faux nonchalant manner while my heart desperately screams at me to jump off the train to dance in the snowfall. 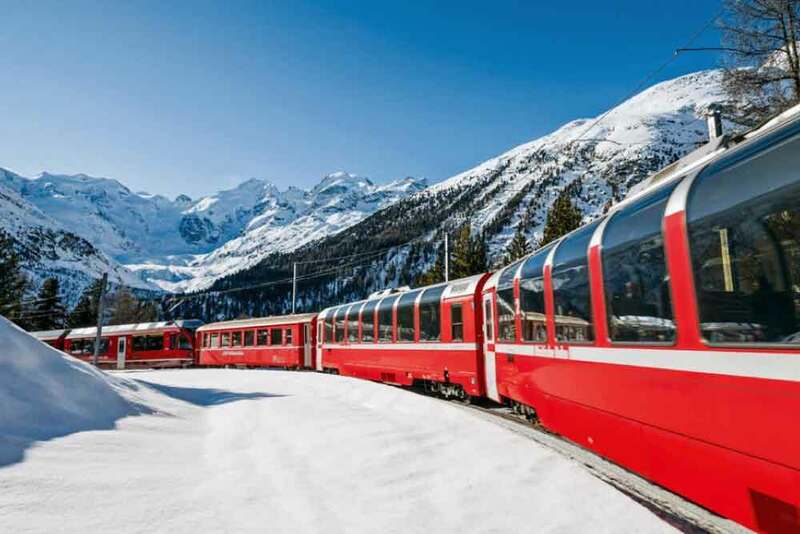 The landscape only gets better as our train weaves around the edge of the vast Lake Zurich, a spectacular glass mirror reflecting the jagged majestic snow covered Alps in the distance. Our train climbs up and up. The ground falls away and disappear behind us, jagged imposing powerful alps prepare to swallow us alive. Such a strange experience, the mountains on one hand are so grand I could easily fade into insignificance and yet their majesty seems to have the opposite effect. The climb into the alps elevates me. With each turn of the train on the track we soar, physically higher and emotionally higher. These mountains, ethereal and yet welcoming bring me with them lifting me to a level of consciousness I never knew was possible. Fürstenau is nestled high in the Alps, only an hour or so further up the mountain you can find the alpine ski resort St Moritz. Only half a square mile in size and with a population of about 345 people, the city of Fürstenau is the smallest city in the world. The castle is a Swiss heritage site of national significance. Thusis train station, this is us! We jump up gather our bags and line up at the door excited to get off the train. The train station is small, cold and dusted in snow. We find the exit and our waiting driver, sent from Schloss Schauenstein to collect us. Our car winds its way from the station through narrow roads and past creamy white buildings topped with salmon pink roofs. We pull into the carpark below the castle. To walk up the front path is the most perfect first view of this incredible building. It is slippery, icy and I need to concentrate on each step to ensure I don’t end up on my arse. I’m trying to be graceful but part of me just wants to lie down in the snow and make angel patterns. Our little castle is stunning. It sits erect, somehow golden and glowing against the grey sky. With each slippery little step up to the front door, my excitement grows. Inside the little castle I am breathless, in part from the cold outside but mostly from the gorgeous elegance of the space I find myself in. High arched ceilings welcome us. Fabulous art works, sculptures and paintings balance the energy, grounding the loftiness of the space into something very warm and attainable. They guide us to our room on the first floor, the first exit off the sweeping central staircase. A large timber door groans open to reveal our palatial suite. A huge four poster bed, rich red comfy sofa, a glorious writing desk and copious wardrobe. 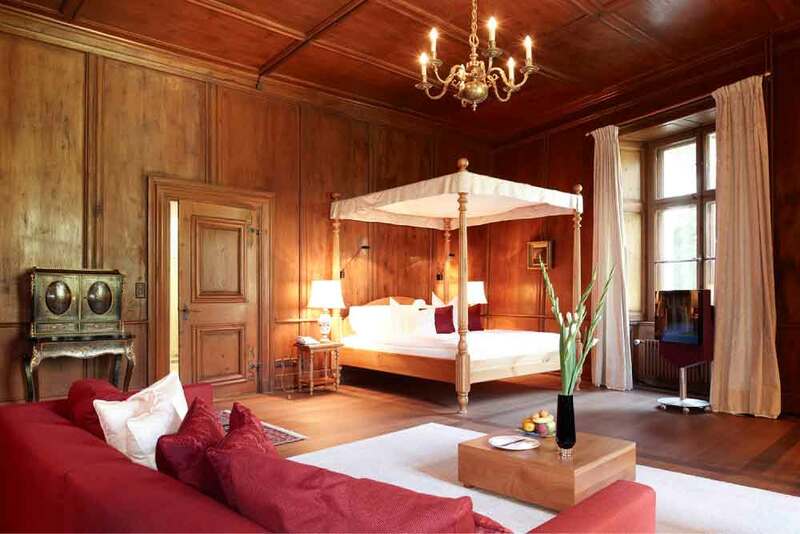 It is the dramatic alpine view from the two expansive windows that is the greatest extravagance of the room. With our hot breath fogging the glass, the only clear glass the small spot where I pressed my nose against the window, I could sit here all night. I am lost in the beauty of the view, my hands rubbing a circle on the glass to look through. My reverie is only broken by my love calling out “love, come see this bathroom”. Our bathroom is exquisite. It’s vast with a big deep bath under the window, but the little folly that tickles my fancy most is the rose petals floating in the toilet! An unhurried afternoon in our lovely suite before dinner is most welcome after our journey. Andreas Caminada might seem on one level rather demanding with his approach to running the castle with absolute Swiss precision. But as I discovered while thumbing through his magazines while enjoying the peaceful comfort of our suite, there is clearly a soft centre behind Caminada’s slick facade. His magazines have wonderful editorials celebrating others. Other chefs, cooks, artists, artisans and his staff. Stories of what he calls the indispensable hearts of the operation. A moving tale of Samdi, the man originally from Sri Lanka who despite long work hours attended language classes daily that Caminada makes possible for all his non German speaking staff. The article highlighting how critical his role of dishwasher at the castle is to the success of the business. The story of Dores, head housekeeper who came from Portugal as her husband was working in Switzerland. Caminada originally found a place for her in the laundry – they now know her as the mistress of the Castle and a mother figure who no one can possibly do without. These stories make me feel like I am not just in a perfectly oiled machine but in a home and that everyone here is part of the Caminada family. Caminadas generosity of spirit also extends to the next generation of talent in the industry. 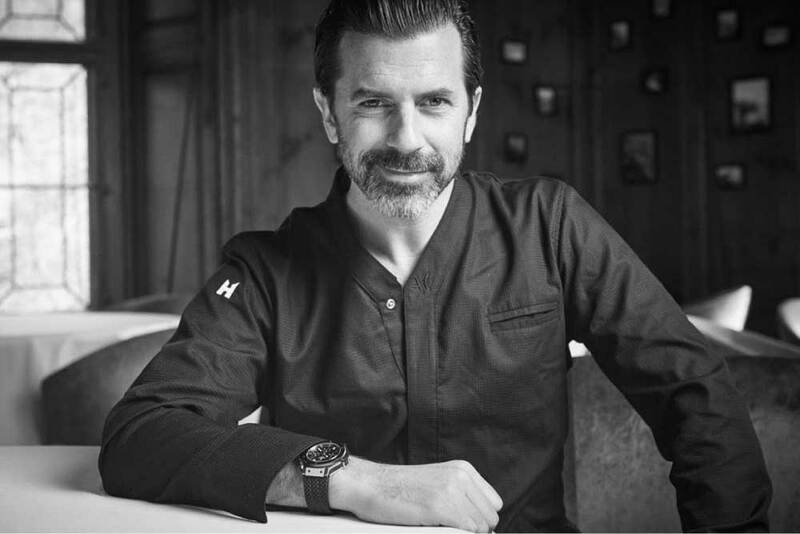 He has created an incredible foundation, that supports talented individuals in the gastronomic industry, to realise their ambitions. Most training options offered in the industry are academic, standardised and structured. Caminada has recognised that individual artistic talents can be forgotten in that approach and has created something very different. His foundation provides opportunities and financial and mentoring support that focuses on fostering individual talent and passion. 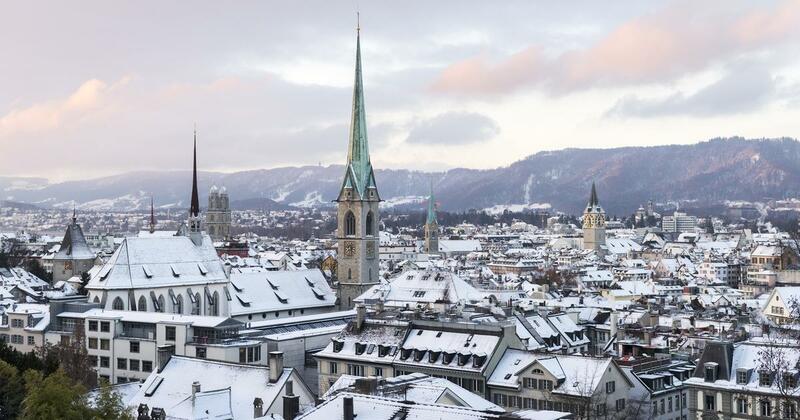 The foundation Uccelin “young bird” has a list of select Swiss establishments that take part. The program puts the apprentice in the driver seat. Their costs are covered by the foundation and they can select an establishment and program of their choice focused on their individual passion. Caminada has created this amazing one of a kind opportunity intending to ignite passion and safeguard culinary diversity. 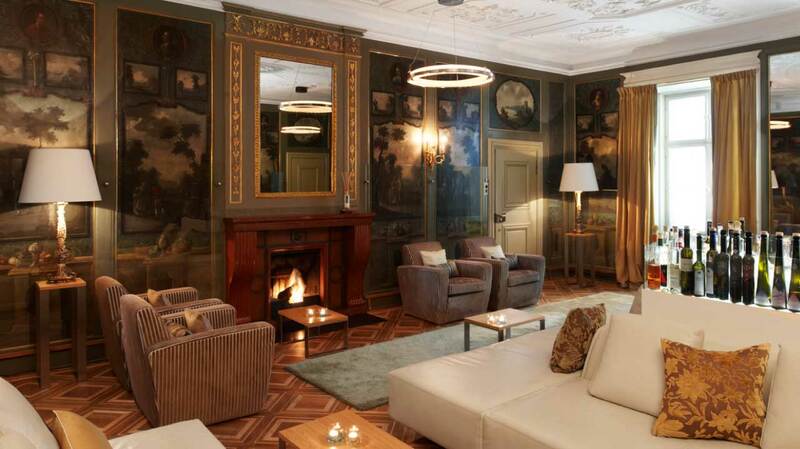 Our evening adventure begins with aperitifs served in the lounge on the first floor where we sip champagne in comfy arm chairs by a crackling fire. 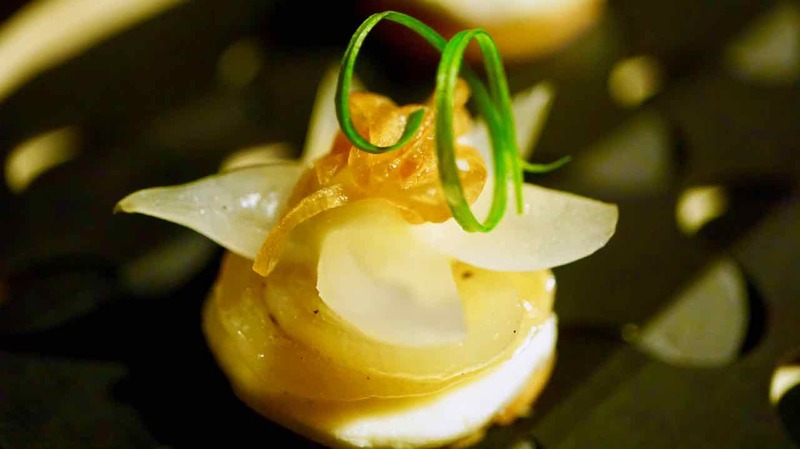 To accompany our drinks, they bring tiny little bites of deliciousness to tease our tastebuds and whet our appetites. 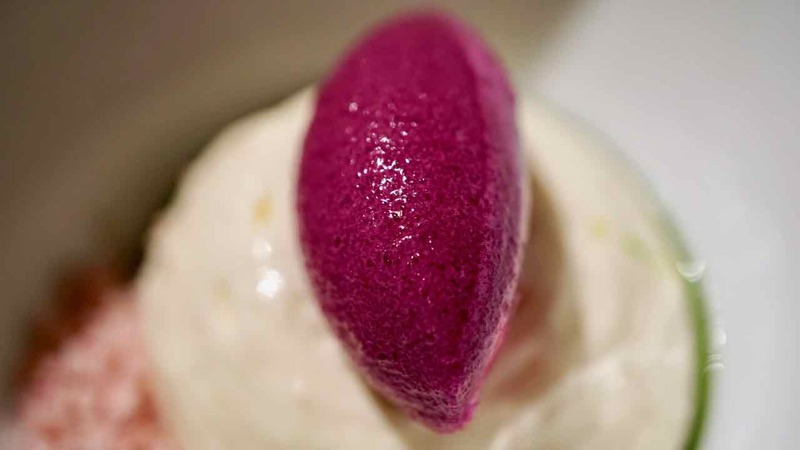 Beetroot Sorbet – a deep purple tiny cone of frosty joy. 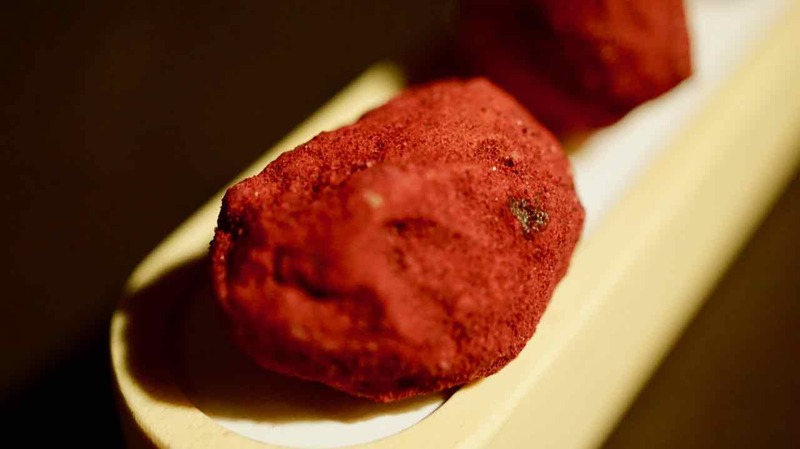 Liver Almonds – little almond shaped bites of decadent duck liver. 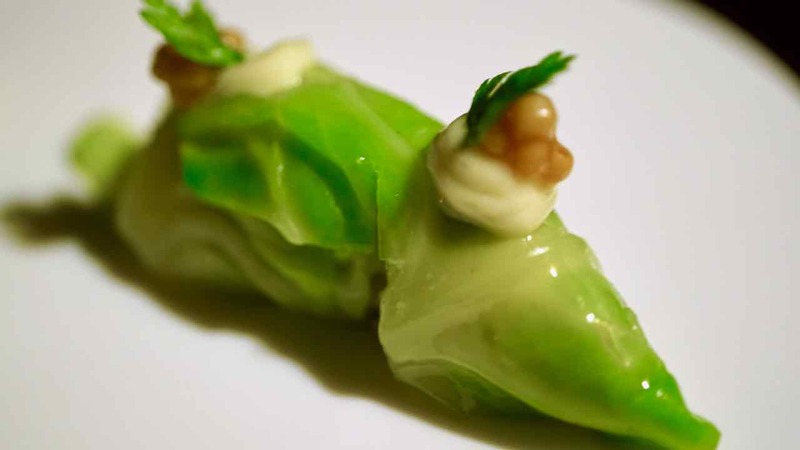 Brussels Sprouts Mustard – what a combination, tender Brussel leaves rolled into almost quenelle shapes. Shallots quiche – in a single bite, the little layers of this bite celebrate the shallot. Truffle, Jerusalem Artichokes, truffle toast – wow, a stunningly simple but deeply earthy bite. 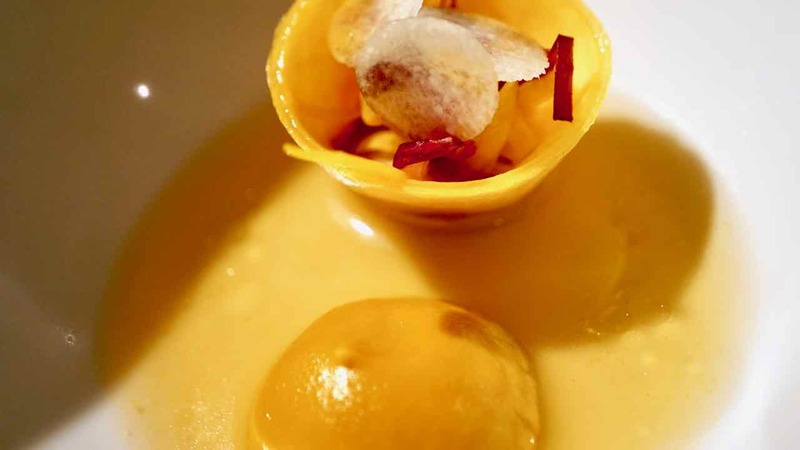 Our first introduction to Andreas Caminada’s cuisine has been so enticing. I am very excited about what awaits us in the main dining room. A perfectly choreographed gentle introduction. The tempo of the dance just enough of a building of rhythm to call us, begging for more to the next part of the story. We soak up the warmth of the fireplace, contemplate the universe and sip the last of our sparkling wine. The time comes to move downstairs to our dining room. High ceilings, a small selection of white linen draped tables and discrete private seating is perfect. The separation and spacing of tables gratefully eases any need for a less than heartfelt interaction with fellow diners. Everything feels like it is just about us. The automatic door slides open and closed as floor staff elegantly and discreetly float between kitchen and tables. Our plates begin to arrive in a perfectly paced rhythmic flow. So perfect that for some it might go unnoticed. 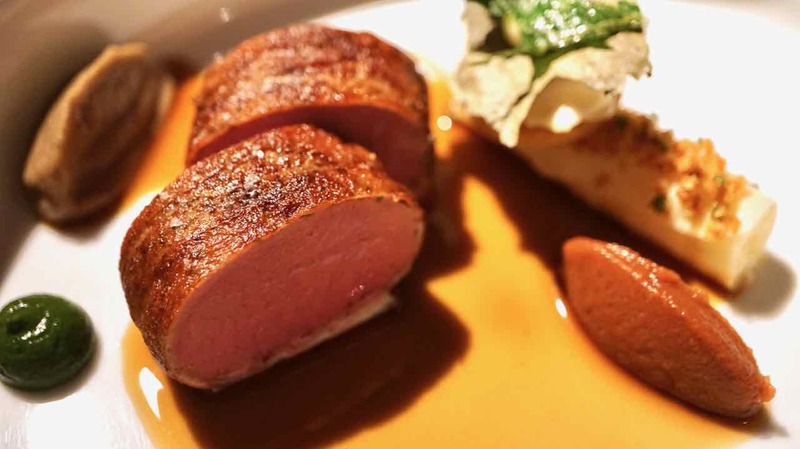 We very much appreciate being gently yet definitely walked through Andreas Caminada’s culinary story. 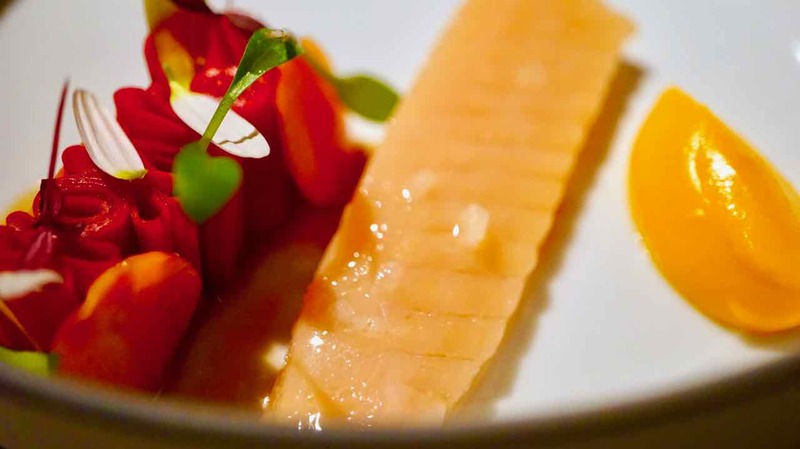 To start whitefish, kohlrabi, red onion – incredibly delicate with every element translucent. 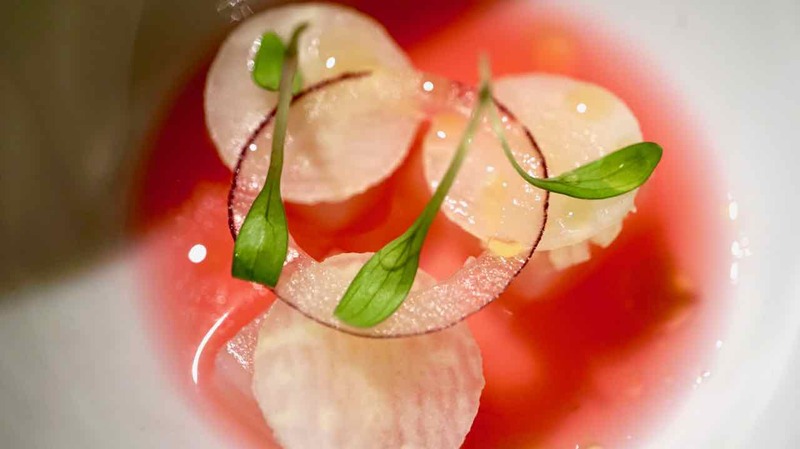 Small cubes of fish, paper thin discs of kohlrabi and the feint hint of a ring of red onion, all bathing in a pretty strawberry pink vinaigrette. This cold dish is bright zingy and lively and the perfect transition to the main affair. The next plate, red cabbage, ham spoom, powder, chive oil. What on earth is spoom? Well it is a sorbet or granita kind of thing. This one is a wonderful light ham flavoured sensation. 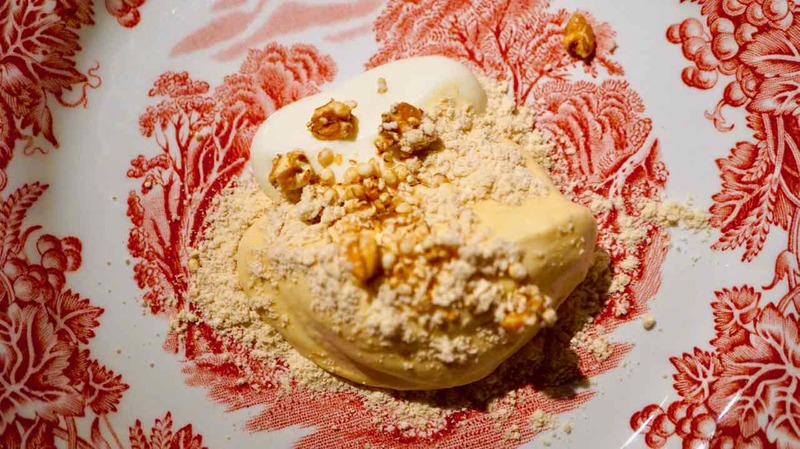 It is cold and sprinkled around a mound of delicate flavoured warm cream topped with a quenelle of red cabbage sorbet. The juxtaposition of temperatures is exciting and the combination of flavours are reminiscent of coleslaw but lifted to an ethereal height. I am particularly fascinated with the visual imagery as the perfectly plated domes of colour spread and merge into a stunning abstract painting of pink green and white as I eat it. Beef tartar dill smoked horseradish beetroot, a magic plate. Finely cut beetroot and smoky horseradish bring a warm earthy foundation to the purity of the beef. Light and refreshing but with a hint of heat. Pumpkin ravioli, puree, bouillon, dried pear creme, cicorino. This was an absolutely standout dish. A little ravioli that wasn’t ravioli. Caminada actually made it from shaved pumpkin. A little dollop of wonderfully smooth and sweet pumpkin puree. All dressed with the most incredible clear consommé. Salty, sweet, sour, the layers of flavour here are incomparable. 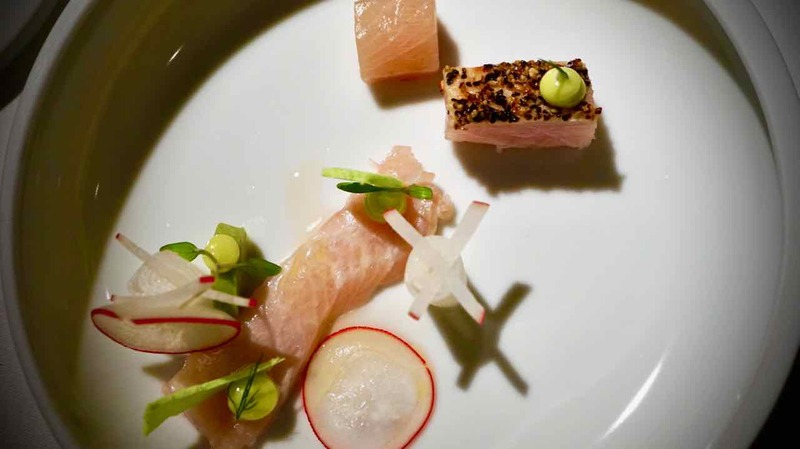 Classic 2011 – Mackerel – Rare, pickled, fried – avocado, lime, radish. To take this fish and present it three ways is a stroke of genius. Fried – just warm sizzled on one size for a moment and just the perfect amount of wasabi to vibe it up. 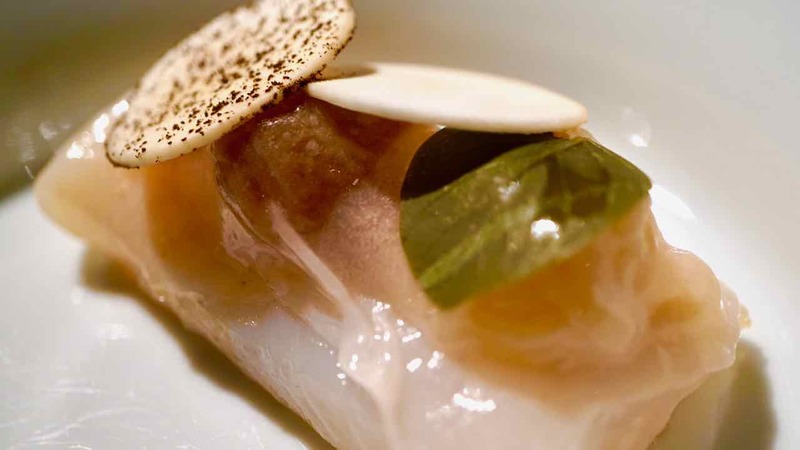 Raw – a square of firm simple fish with no embellishment celebrates the purity of the fish. Pickled – a lightly cured slice of fish small crispy pops of lime and fresh zingy pickled radish. Next is a little surprise dish, Trout slightly cooked, carrot puree pickled, smoked fish mousse, petals. A perfect slice of trout, just warm is absolute perfection, I don’t want to mix it with anything else. 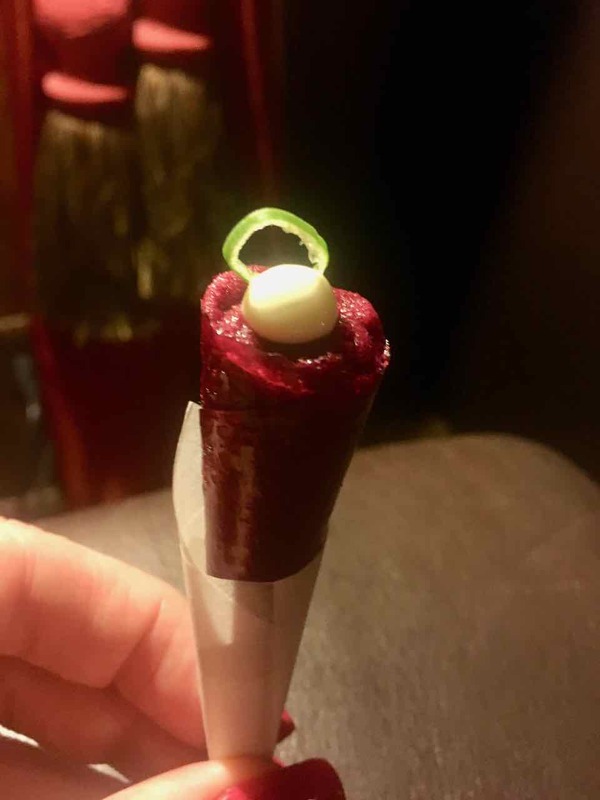 Served with the prettiest arrangement of finely shaved folds of pickled purple carrot. Fish mousse smoky and creamy and a carrot puree so smooth, creamy and vibrantly carrot. As each dish arrives I am mesmerised by the amazing door to the kitchen. A heavy heritage frame, so low that some staff only just fit beneath it without bumping their heads. Juxtaposed with a modern automatic door that silently slides open and closed with each new treasure that emerges from the kitchen. Sweetbread roasted, plum pickled, dried bean creme. I am a little nervous about this one. I somehow still find offal a challenge. Crispy bacon wraps the little morsel of gland, white and tender inside. 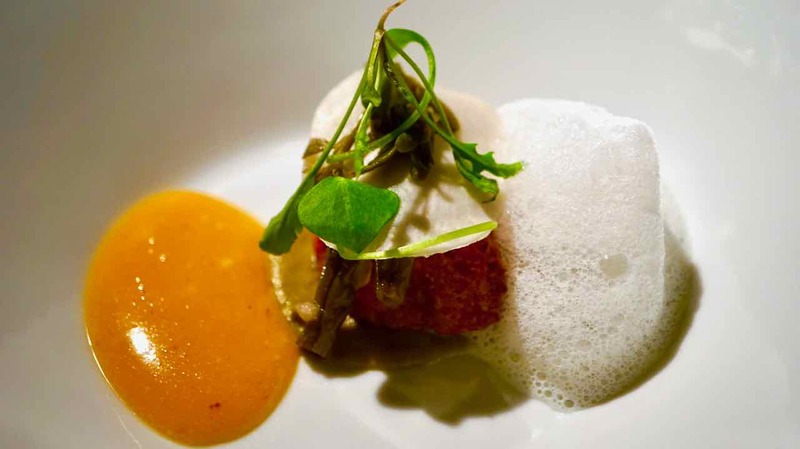 A roasted apple honey sauce is wonderfully rich, and a light dried bean foam a playful light touch, suddenly sweetbread makes sense. Our next plate, Pikeperch slightly cooked, onion Laredo capers, reduction of red wine, beurre Blanc. Again such perfectly considered simplicity. Delicate, just warmed through fish, maintaining the purity of the texture and flavour of the fish. Small, subtle accompaniments that accentuate the sweetness of the fish. Just a delight. After an amazing series of light and breezy fish dishes it is time for the gravitas of a meat dish. Venison bacon, celery grilled creme, hazelnut crumble, quince creme. Two perfect discs of tender pink venison wrapped with super thin crispy bacon. 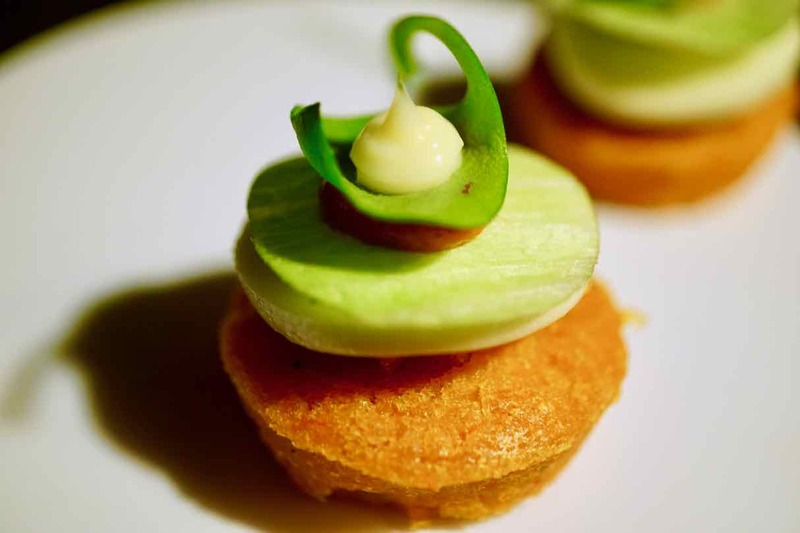 Tender sweet celery with a little disc of pastry and a sprinkling crumbly brown hazelnut for crunch. I sweep the first taste through the shiny golden jus and it is delicious. The addition of the quince creme is an absolute sensation. A perfect finish to the savoury elements of the menu. Grandmothers burnt cream beignets. The first sweet sensation is a simple but moving tribute to Andreas’ grandmother. A generous dollop of burnt custard cream arrives on a pretty patterned old fashioned plate. A small mound of caramel hiding below and a spoonful of rich white cream. Crunchy sprinklings of puffed rice finish this little plate. To go with it, a big bowl of deep golden beignets. 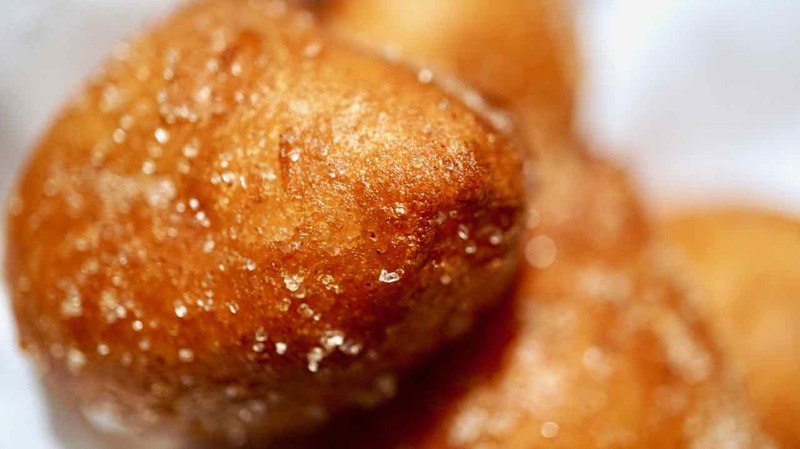 These are little puffs of doughnut, light fluffy and dusted in sugar, yummy bites dragged through the wonderful custard and cream. From old fashioned indulgence Caminada transports us to restrained modernity. 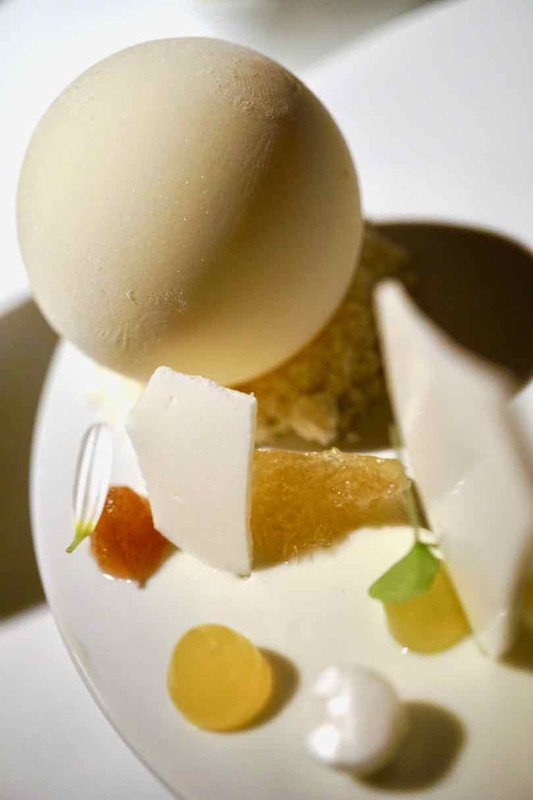 Classic 2012 – lemon yogurt. 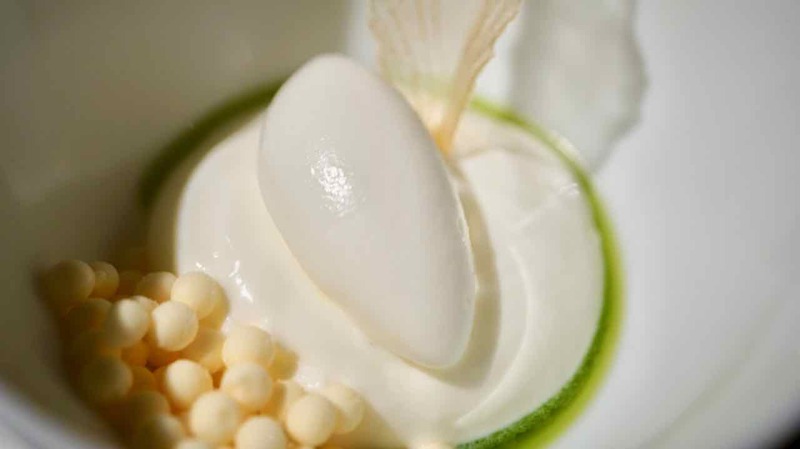 A large white flat plate with a perfect frozen yoghurt sphere filled with lemon cream balanced on the edge. A trail of amazing treats wanders along the edge behind it. 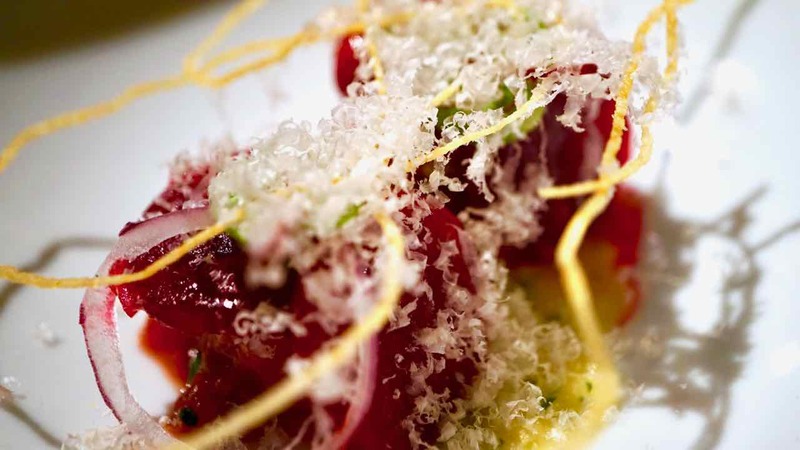 This dish is the perfect counter balance to everything that has come before. Zippy vibrant and exciting, this plate cleans the pallet and refreshes our energy. Then Amalfi Lemon, iced candied pickled, yogurt ice cream. Lemon beads, sour lemon leaf and eye wateringly good tarragon oil. Invigorating. And finally Curd Soufflé (top right). A very different textured soufflé almost like a lemony baked custard. I adore it. This trilogy of bright desserts bring a surprising lift at the end of a magical meal. We say goodbye to the lovely dining room and make our way back up the spiral stone stair to the lounge. Settled in to a soft chair by the fire we happily recount the fairytale so far. Our tale of the adventure further coloured by the most exquisite tray of magical treats. 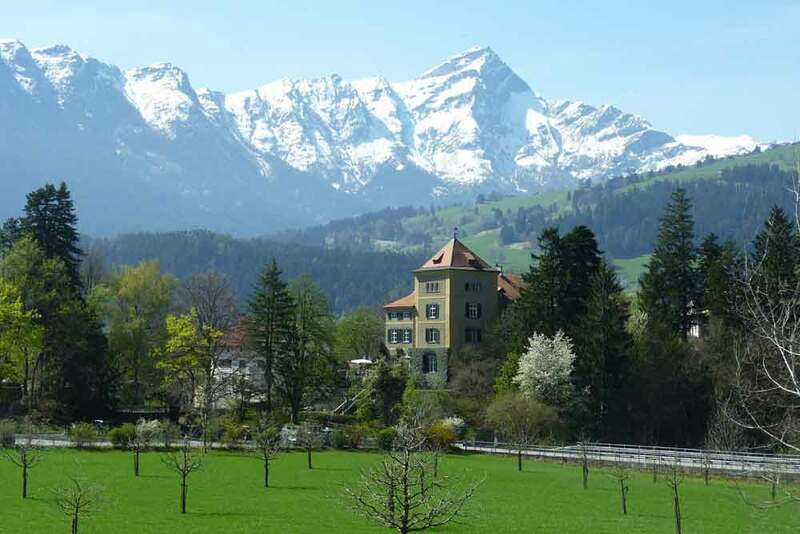 Echoing the fierce majesty of the Alps that surround it, the menu of Schloss Schauenstein has taken us to exceptional heights. Amuse bouches served by the fire in a small salon before being escorted to the dining room was a special start to the evening. A memorable walk through a fascinating selection of dishes that tell stories of Andreas Caminada’s life. 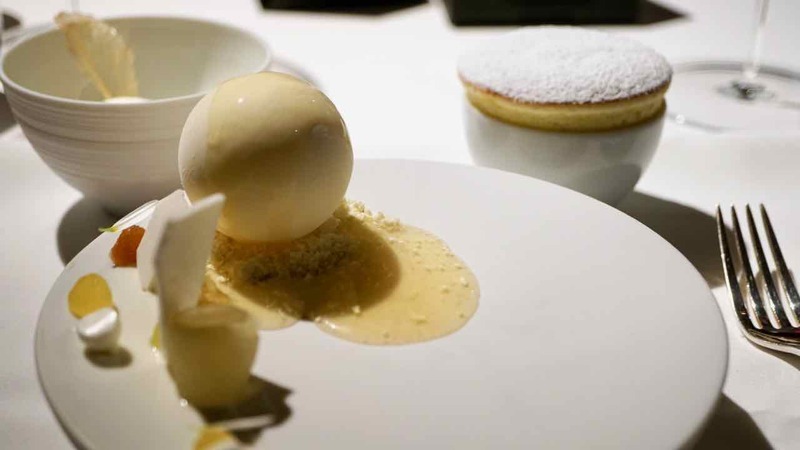 Even a nod to his grandmother with stunning little Beignets with a simple burnt cream. Not difficult but meaningful. To finish the evening again in a little bar salon with the flickering warmth of an open fire melting the edges of a selection of elegant petit fours is perfect. Through out our entire experience we have enjoyed exceptional service with everything moving in seamless synchronicity. Friendly, attentive, warm and very real. I thought it couldn’t get any better. Then the final surprise, chef Andreas Caminada walks across the room and dips down on one knee extending a hand in introduction. With the warmth of a delicious 1976 cognac still in my belly from my birthday toast, we take one last walk on the snow dusted balcony to take in the monumental surroundings of the Alps. This trip has been a fairytale experience in so many ways. Andreas Caminada’s story is one imbued with a generosity of spirit. Less a reflection of ego and more an expression of creativity, grounded in his roots and his respect for his craft, the craft of gastronomy. Thank you Andreas for sharing your story with us and for a forever memorable birthday.